Dutch cuisine (Dutch: Nederlandse keuken) is formed from the cooking traditions and practices of the Netherlands. The country's cuisine is shaped by its location in the fertile North Sea river delta of the European Plain, giving rise to fishing, farming (for crops and domesticated animals), and trading over sea (colonialism and the spice trade). Traditionally, Dutch cuisine is simple and straightforward, with many vegetables and little meat: breakfast and lunch are typically bread with toppings like cheese, while dinner is meat and potatoes, supplemented with seasonal vegetables. The diet contains many dairy products and was relatively high in carbohydrates and fat, reflecting the dietary needs of the laborers whose culture molded the country. Without many refinements, it is best described as rustic, though many holidays are celebrated with special foods. During the twentieth century, Dutch cuisine and diet changed. Influenced by the eating culture of its colonies (particularly the Dutch East Indies), it became more cosmopolitan and most international cuisines are represented in the major cities. Little evidence is available about food and drink in the late medieval Low Countries. In the consumption of pottage, the Low Countries were not very different from other Western European countries during the Middle Ages. Half-liquid pottage consisted of milk, beer, water, root vegetable and peas or grain, sometimes enriched with a piece of meat. The content changes throughout the seasons. Beer flavoured with gruit was produced until the 14th century at the monasteries. Gruit was replaced with hop, a tradition introduced from the German city of Bremen, and this started off a beer culture and the Low Counties as a major exporter of beer. Beer was in medieval times the common drink as water was of poor quality, and milk -coming from the low-lying grasslands of Holland and Friesland – was mainly used for the production of butter and cheese. Dutch butter and cheese became famous products at an early stage and continued to be so for centuries. The sea and the rivers provided an abundance of fish. The process of gibbing was invented by Willem Beukelszoon, a 14th-century Zealand fisherman. The invention created an export industry for salt herring (Dutch: maatjesharing) that was monopolized by the Dutch. They began to build ships and eventually moved from trading in herring to colonizing and the Dutch Lowlands (the Netherlands as a country did not exist until 1581), ultimately leading to the Dutch becoming a seafaring power. Herring is still very important to the Dutch who celebrate Vlaggetjesdag (Flag Day) each spring, as a tradition that dates back to the 14th century when fishermen went out to sea in their small boats to capture the annual catch (Hollandse Nieuwe), and to preserve and export their catch abroad. Gardening was initially practiced by monasteries, but castles and country houses began also to develop gardens with herbs and vegetables and hunting grounds. The famous tourist attraction and flower park Keukenhof (literally kitchen garden) is an example of a former 15th-century hunting ground and herbs garden for Jacqueline, Countess of Hainaut's castle kitchen. Orchards for pears and apples connected to castles were later used for export and set off a Dutch horticulture tradition that remains to this day. During the 15th century haute cuisine began to emerge, largely limited to the aristocracy. Cookery books from this period are aimed at the upper class. The first Dutch-language cook book printed in Brussels is called Een notabel boecxken van cokeryen (A notable book of cookery). It offers medieval recipes for festivities, such as sauces, game, jellies, fish, meat, pies, tarts, eggs, dairy products, candied quinces and ginger. The recipes come from various sources, many of them French. Historically, Dutch cuisine was closely related to northern French cuisine, since the two countries have nearby borders and the Low Countries and Northern France have been historically ruled by the Dukes of Burgundy. This is still visible in traditional Dutch restaurants and the Southern regional cuisine, that is still colloquially referred to as Bourgondisch. As the Dutch Republic enters its Golden Age in the 17th century, dishes of this kind became available to the wealthy middle class as well, often consisting of a rich variety of fruits, cheeses, meat, wine, and nuts. The Dutch Empire enabled spices, sugar, and exotic fruits to be imported to the country. The Dutch East India Company was the first to import coffee on a large scale to Europe. The Dutch later grew the crop in Java and Ceylon. The first exports of Indonesian coffee from Java to the Netherlands occurred in 1711. By the late 17th century, tea and coffee consumption were increasing and becoming part of everyday life. Tea was served with sweets, candy or marzipan and cookies. The availability of relatively cheaper spices resulted in a tradition of spiced cookies called speculaas, the exact recipes of which were kept secret by bakers. Vegetables, meat, poultry and salted, smoked or fresh fish and eggs were prepared in the Dutch kitchens of the time. The meal started with green salads and cold or warm cooked vegetables with dressing, vegetable dishes with butter, herbs or edible flowers and continued with numerous fish- and meat dishes. Exotic ingredients such as dates, rice, cinnamon, ginger and saffron were used. Savoury tarts and pastries followed. The meal ended with jellies, cheese, nuts and sweet pastries, washed down with sweet spiced wine. Of course, even in the Golden Age, not everyone could afford such luxuries and the everyday meal of the ordinary Dutchman was still a humble affair of grain or legume pottage served with rye. During the nineteenth century, the poor people drank little else but water (of poor quality), sometimes watery coffee (or chicory) or tea. In some areas hot chocolate was consumed, but the most popular drinks (beside water) were beer and jenever. For most of the century beer was drunk in the southern part, where Catholicism dominated, and in Catholic enclaves in the other areas. Jenever consumption early in the nineteenth century was twice that of the equivalent consumption of distilled in neighboring countries. The region is the least populated area of the Netherlands. The late (18th century) introduction of large scale agriculture means that the cuisine is generally known for its many kinds of meats. The relative lack of farms allowed for an abundance of game and husbandry, though dishes near the coastal regions of Friesland, Groningen and the parts of Overijssel bordering the IJsselmeer also include a large amount of fish. The various dried sausages, belonging to the metworst-family of Dutch sausages, are found throughout the region and are highly prized for their often very strong taste. Most towns and various villages have their own variety of this sausage. The region also produces the traditional smoked sausages, of which (Gelderse) rookworst is the most renowned. These sausages traditionally have been smoked over wood chips, and are served after they have been boiled in water. The sausage contains a lot of fat and is very juicy. Larger sausages are often eaten alongside stamppot, hutspot or zuurkool (sauerkraut); whereas smaller ones are often eaten as a street food. The provinces are also home to rye bread (a kind of Pumpernickel) and many kinds of pastries and cookies. In contrast to southern Dutch cuisine, which tends to be soft and moist, the northeastern rye bread and pastries generally are of a hard texture, and the pasties are heavily spiced with ginger or succade or contain small bits of meat. Various kinds of Kruidkoek (such as Groninger koek [nl]), Fryske dúmkes [nl] and spekdik [nl] (small savory pancakes cooked in a waffle iron) are considered typical. Each of the provinces of Gelderland, Overijssel and Groningen has a long-standing rye bread tradition, but rye bread from Friesland became well known because of its taste. Notable characteristics of Fries roggebrood (Frisian rye bread) is its long baking time (up to 20 hours), resulting in a sweet taste and a deep dark color. In terms of alcoholic beverages, the region is renowned for its many bitters (such as Beerenburg) and other high-proof liquors rather than beer, which is, apart from Jenever, typical for the rest of the country. As a coastal region, Friesland is home to low-lying grasslands, and thus has a cheese production in common with the Western cuisine. Friese Nagelkaas (Friesian Clove) is a notable example. The provinces of North Holland, South Holland, Zeeland, Utrecht and the Gelderlandic region of Betuwe are the parts of the Netherlands which make up the region in which western Dutch cuisine is found. Due to the abundance of surface water and grassland, necessary to sustain dairy cattle, the area is known for its many dairy products, which includes prominent cheeses such as Gouda, Leyden (spiced cheese with cumin), Edam (traditionally in small spheres) as well as Leerdammer, and Beemster. Zeeland and South Holland produce a lot of butter, which contains a larger amount of milkfat than most other European butter varieties. A by-product of the butter-making process, karnemelk (buttermilk), is also considered typical for this region. Seafood such as soused herring, mussels (called Zeeuwse Mosselen, since all Dutch mussels for consumption are cleaned in Zeeland's Oosterschelde), eels, oysters and shrimps are widely available and typical for the region. Kibbeling, once a local delicacy consisting of small chunks of battered white fish, has become a national fast food, just as Lekkerbekje [nl]. Pastries in this area tend to be quite doughy, and often contain large amounts of sugar; either caramelized, powdered or crystallized. The oliebol (in its modern form) and Zeeuwse bolus are good examples. Cookies are also produced in great number and tend to contain a lot of butter and sugar, like stroopwafel, as well as a filling of some kind, mostly almond, like Gevulde koek [nl]. Zaanstreek in North Holland is known for its chocolate industry, due to the development of the Dutch process chocolate In 1828 by Coenraad van Houten, that introduced the modern era of chocolate and was instrumental in the transformation of chocolate to its solid form which was up till than drank as a liquid. Zaanstreek is since the 16th century also known for its mayonnaise (for the Dutch a popular condiment to eat with French fries), and typical whole-grain mustards (popular to eat with bitterballen). The traditional alcoholic beverages of this region are beer (strong pale lager) and Jenever, a high proof juniper-flavored spirit, that came to be known in England as gin. A noted exception within the traditional Dutch alcoholic landscape, Advocaat, a rich and creamy liqueur made from eggs, sugar and brandy, is also native to this region. Stews, such as hachee, a stew of onions, beef and a thick gravy, contain a lot of flavour and require hours to prepare. Vegetable soups are made from richly flavored stock or bouillon and typically contain small meatballs alongside a wide variety of different vegetables. Asparagus and witloof are highly prized and traditionally eaten with cheese or ham. The traditional alcoholic beverage of the region is beer. There are many local brands, ranging from Trappist beer to Kriek lambic. 5 of the 11 International Trappist Association recognised breweries in the world, are located in the Southern Dutch cultural area. Beer, like wine in French cuisine, is also used in cooking; often in stews. Dutch agriculture roughly consists of five sectors: tillage-based, greenhouse-based, fruit agriculture, animal husbandry and fishery. Tillage-based crops include potatoes, kale, beetroot, green beans, carrots, celeriac, onions, all the common kinds of cabbages, Brussels sprouts, cauliflower, endive, spinach, Belgian endive, asparagus and lettuce. Recently some initiatives have been started to encourage interest in such "forgotten" vegetables as common purslane, medlars, parsnips, and black salsify. The Dutch keep cattle for milk, butter, cheese, and for their meat, chickens for their eggs and for meat, pigs for their meat and a variety of non-edible products, and sheep for their wool and meat. Usually, the goat meat is increasingly kept for a cheese production. Traditionally, the horse meat was a common dish (steak, sausage, and thinly-sliced smoked meat) but is less popular today. The fishery sector lands cod, herring, European plaice, sole, mackerel, eels, tuna, salmon, trout, oysters, mussels, shrimp, and sardines. The Dutch are famous for their smoked eel and soused herring, which is eaten raw. Indonesian and Indo dishes became popular due to the arrival of former Dutch colonials and people of Eurasian descent into the Netherlands, especially after the independence of Indonesia from Dutch colonial rule in 1949. C. Countess van Limburg Stirum writes in her book The Art of Dutch Cooking (1962): "There exist countless Indonesian dishes, some of which take hours to prepare; but a few easy ones have become so popular that they can be regarded as 'national dishes'". She then provides recipes for nasi goreng (fried rice), pisang goreng (fried bananas), lumpia goreng (fried spring rolls), bami (fried noodles), satay (grilled skewered meat), satay sauce (peanut sauce), and sambal oelek (chilli paste). Of the Dutch-Indonesian fusion dishes the best known is the rijsttafel ("Rice table"), which is an elaborate meal consisting of many (up to several dozens) small dishes (hence filling "an entire table"). While popular in the Netherlands, Rijsttafel is now rare in Indonesia itself, while almost every town in the Netherlands has an Indonesian-Chinese restaurant. A popular fusion dish is friet saté [nl] or patatje pinda, French fries with satay sauce as condiment, served at snack bars. Surinamese cuisine is also popular in the Netherlands, especially in the bigger cities. Surinamese establishments commonly offer roti, a staple of the Hindustani community in Suriname, various Surinamese interpretations of Chinese Indonesian cuisine, as well as Surinamese sandwiches (Surinaamse broodjes). Italian and American style pizzerias have become widespread. In recent decades, Arab and Turkish dishes have become increasingly popular as well, especially as a snack food. In larger towns and cities, small restaurants selling kebabs, shawarma, and falafel can be found on virtually any street corner. Nowadays, food from every nook or corner of the world can be found throughout the country, especially in bigger towns and cities, including Greek, Thai, Japanese, and even African cuisines. Hagelslag, muisjes and vlokken on display in a Dutch supermarket. Breakfast and lunch differ little in Dutch cuisine and both consist of bread with a wide variety of cold cuts, cheeses and sweet toppings; such as hagelslag, vlokken, muisjes, gestampte muisjes [nl], chocolate spread, treacle (a thick, dark brown sugar syrup called stroop), apple butter and peanut butter. The Dutch are famous for their dairy products and especially for their cheeses. The vast majority of Dutch cheeses are semi-hard or hard cheeses. Famous Dutch cheeses include Gouda cheese, Edam cheese, and Leyden cheese. A typically Dutch way of making cheese is to blend in herbs or spices during the first stages of the production process. Famous examples of this are cheeses with cloves (usually the Friesian Clove), cumin (most famously Leyden cheese), or nettles. A popular Dutch story (never confirmed) says that in the late 1940s the wife of the then Prime minister, Willem Drees, served coffee and one biscuit to a visiting American diplomat, who then became convinced that the money from the Marshall Plan was being well spent. Café au lait is also very common. It is called koffie verkeerd (literally "wrong coffee") and consists of equal parts black coffee and hot milk. The Dutch drink tea without milk and the tea is quite a lot weaker than typical English or Irish types of tea which are stronger and are usually taken with milk. Other hot drinks used to include warm lemonade, called kwast (hot water with lemon juice), and anijsmelk (hot milk with aniseed). In the autumn and winter the very popular hot chocolate or chocolate milk is drunk. Both anijsmelk and kwast are hardly drunk any more and have lost their popularity. Between 8:00 pm and 9:00 pm it is time for an alcoholic beverage, beer or wine, and a savory snack. This is when the famous 'Bitterballen' can be served. A mini variant on the 'kroket', deep-fried ragout filled balls with a crunchy layer of very fine bread-crumbs. Served with mustard. Borreltijd mostly occurs in the weekends. Dinner, traditionally served early by international standards, starts around or even before 6 o'clock in the evening. The old-fashioned Dutch dinner consists of one simple course: potatoes, meat and vegetables—known under the acronym "AVG" (aardappelen, vlees, groente). Traditionally potatoes with a large portion of vegetables and a small portion of meat with gravy, or a potato and vegetable stew. Vegetable stews served as side dishes are for example rodekool met appeltjes (red cabbage with apples), or rode bieten (beetroot). Regular spices used in stews of this kind may be bay leaves, juniper berries, cloves, and vinegar, although strong spices are generally used sparingly. Stews are often served with pickles, including augurken (gherkins) or cocktail onions (zilveruitjes). Due to the influx of other countries traditional meals have lost some popularity. Stamppot, mashed potatoes with different options for vegetables, is traditionally eaten in winter. If there is a starter, it is usually soup. Boerenkoolstamppot, curly kale mixed with potatoes, served with gravy, mustard, and rookworst sausage. It is one of the oldest and most popular Dutch dishes. Boerenkool was mentioned in cookbooks from the year 1661. 1661 mashed potatoes were not used in this dish yet, although the sausage was already served with the cabbage in this dish. The dish became popular after a few bad corn-seasons when potatoes became popular as food. Boerenkoolstamppot is high in carbohydrates, which makes it a popular meal for cold winter days. Pannekoeken (large pancakes) with bacon, apples, cheese, or raisins. Wentelteefjes [nl] (similar to French toast). Mosselen [nl] (mussels) are quite popular and commonly served with french fries. Kibbeling, chunks of sea fish that are battered and fried. Broodpap [nl], a bread porridge made from old bread, milk, butter, and sugar. Griesmeelpudding [nl], a sweet pudding made of semolina and served with red berry coulis. The Dutch festival of Sinterklaas is held on 5 December. Saint Nicholas leaves gifts in the children’s shoes. On this occasion, the Dutch drink hot chocolate milk and eat spice cookies, like speculaas. Special treats distributed by Saint Nicholas' aide Zwarte Piet include pepernoten (irregular shaped small cookies made of rye, honey and anise, often confused with kruidnoten); kruidnoten (gingernut-like biscuits but made with speculaas spices: a mix of cinnamon, pepper, cloves, and nutmeg); boterletter [nl] or banket (a baked pastry crust filled with a sugared almond paste filling and shaped into a letter); chocolate letters; marzipan (often in the shape of animals or other topical items), borstplaat [nl] (discs of fondant); and taaitaai [nl]. Christmas in the Netherlands is a typical family holiday. Traditionally there is family brunch with paasstol (fruited raisin bread; often filled with almond paste). Christmas dinner is also a family occasion where rollade [nl] (a kind of roulade consisting of spiced pork), roast pork, game, or other luxury meat may be served. On New Year's Eve, Dutch houses smell of the piping hot oil of deep-fat fryers used to prepare oliebollen and appelbeignets [nl] (a kind of apple fritter) – not to be mistaken for the appelflap [nl] which is completely different. 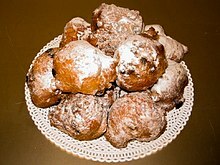 Also ananasbeignets (pineapple fritter) are considered a treat. Oliebollen are yeast dough balls, either plain or filled with glacé fruits, apple pieces, raisins, and sultanas are served with powdered sugar and are a special treat for New Year's Eve. In the 17th century, Dutch settlers also took their oliebollen to the American colonies, where they are now known in a slightly different form as doughnuts. In Limburg, nonnevotten are sometimes served during New Year's Eve, although it is mostly eaten during Carnival. Around New Years kniepertjes [nl] are popular, in particular in the northern provinces. On birthdays all kinds of cakes and cookies are eaten, including appeltaart, bokkenpootjes [nl], bossche bol, dikke koek [nl], Fryske dúmkes [nl], gevulde koek [nl] (cookies filled with almond meal), Groninger koek [nl], janhagel, jan in de zak [nl], ketelkoek [nl], krakeling [nl], krentenwegge [nl], kruidkoek [nl], Limburgse vlaai [nl], oudewijvenkoek [nl], peperkoek (gingerbread), rijstekoekje [nl], spekkoek (originally from Indonesia), spritskoek [nl], tompouce, trommelkoek [nl], bitterkoekjes [nl], kletskopje [nl], and stroopwafel. Poffertjes are tiny puffed pancakes served on special occasions, served warm with melting butter and powdered sugar on top. They are mostly combined with a drink: plain milk, chocolate milk, or a yogurt drink. Cafeterias all around the Netherlands sell poffertjes. Dutch people call such a restaurant a poffertjeskraam [nl]. Poffertjes can be eaten as a dessert after dinner or as a sweet lunch. A famous Dutch sweet is zoute drop and other liquorice sweets. These sweets are small, black and look much like gums. Similar to Pontefract cakes found in Yorkshire, England. The four types of drop are soft sweet, soft salt, hard sweet, and hard salty drop. Liquorice can be bought in shops and pharmacies. It also has a medical function as it is supposed to soften the symptoms throat and stomach aches. Dutch drop is sold in a large variety of shapes and forms. When they are flavored with coconut fondant they are called Engelse drop [nl] (lit. "English liquorice"; liquorice allsorts). Other varieties are made with honey (honingdrop [nl]), mint (muntdrop [nl]), salammoniac (salmiakdrop), or laurel (laurierdrop [nl]). Typical shapes are diamonds, ovals, oblongs, and as coins. A honeycomb shape for honey honingdrop [nl] is also popular. Some manufacturers have introduced speciality ranges where the drop is made in thematic shapes, such as cars (autodrop [nl]), farm animals, and farm machinery (boerderijdrop [nl]), etcetera. One of the Dutch confectionery specialties is vlaai. It is a sweet pie made with a yeast dough and filled with fruit (such as apple, apricot, pineapple, plum, or berry filling). Other ingredients may include custard and rhubarb. Rice vlaai, stuffed with a rich rice-and-cream filling, and pudding vlaai sprinkled with crumbs are also popular. They can be additionally grafted with fruits, whipped cream or chocolate. Banket is a type of pastry or cookie that is traditionally eaten on Saint Nicholas Day (December 6, but celebrated as a children's feast on the 5th) and on Christmas Eve in Holland. Wine plays only a modest role in Dutch cuisine, but there are many brands of beer and strong alcoholic liquor. The most famous Dutch beer producers are Heineken in the west, Grolsch in the east, Alfa and Bavaria in the south. Traditionally, Noord-Brabant and Limburg had a strong beer tradition, brewing many different types of beer (not unlike beer in Belgium). The Dutch cities in the west used to have a long brewing tradition as well, but in the 20th century, big brewers took over many of these smaller breweries or offered them a license to sell their beer brand, while stopping their own production. In the 21st century, many new microbreweries were founded, brewing top fermenting beers in many different styles. In September 2013, there were 184 active breweries in the Netherlands. Popular styles include bock, trappist ale, stout, and wheat beer. Of the range of bitters, Beerenburg is the most famous. Strong liquors include Jenever (distilled malt wine and the precursor to Gin), Brandewijn [nl] (brandy) and Vieux, which is an imitation Cognac, but also Kandeel (made from white wine), Kraamanijs [nl] (a liquor made from aniseed), Oranjebitter [nl] (an orange-flavored brandy, which is traditionally served on festivities surrounding the royal family), Advocaat, Boerenjongens (raisins in brandy), and Boerenmeisjes [nl] (apricots in brandy). The Dutch have their own types of fast food, sold at a snack bar. A Dutch fast food meal often consists of a portion of French fries (called patat or friet), with a sauce and a meat product. The most common sauce to accompany French fries is fritessaus (a low fat mayonnaise substitute), while others can be ketchup or currysaus, hot peanut sauce, a pickle relish of chopped vegetables and spices, such as piccalilli or joppiesaus. Sometimes the French fries are served with a combinations of different sauces, most famously speciaal (lit. "special"), which consists of mayonnaise with spiced ketchup, chopped raw onions, and oorlog [nl] (lit. "war"), which consists of fries covered in a generous amount of hot peanut sauce, mayonnaise, and chopped raw onions. A recently introduced Dutch-Turkish variety from Rotterdam is the kapsalon (lit. "barbershop"), consisting of fries, topped with either shawarma, kebab, or döner kebab and finished with salad, cheese, and various sauces such as sambal and garlic sauce. Snacks made with meat are usually deep fried. This includes the frikandel (a skinless minced meat sausage), and the kroket (a meat ragout roll covered in breadcrumbs). They are available in bread rolls, especially Broodje kroket in order to take away. 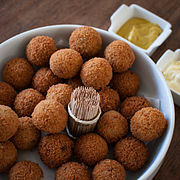 A smaller, round version of the croquette, which is the bitterballen, is often served with mustard as a snack in bars but also at official receptions. Regional snacks include the eierbal [nl] (a combination of egg and ragout) in the north and east of the country, and the slightly spiced Brabants worstenbroodje [nl] or saucijzenbroodje [nl], slightly spiced sausage meat baked in pastry (similar to the English sausage roll). Croquette-like wrapped and fried chicken meat is Kipcorn and similar vlees balls [nl] (meat balls). Other snacks are the Indonesian-inspired bamischijf (a disk shaped mie goreng patty which is covered with breadcrumbs and deep-fried), nasischijf [nl] (similar to the bamischijf, a deep-fried nasi goreng filled ball covered in breadcrumbs), and kaassoufflé (lit. "cheese soufflé" it is a deep fried puff pastry envelope with a small amount of cheese in the center, popular with vegetarians). Fish is also sold as fast food at the so-called viskraam, most often street stalls and market stalls that specialize only in prepared fish products. The Netherlands is famous for its raw herring, optionally served together with chopped raw onions and gherkins, and which is eaten by lifting the herring high up into the air by its tail, and then biting into it upwards (except for Amsterdam, where the herring is cut to pieces and served on paper platter). Raw herring is also commonly sold in a soft white bun. Other popular fish snacks are kibbeling (deep-fried nugget-sized chunks of Atlantic cod), lekkerbekje [nl] (deep-fried cod, similar to the British fish and chips, but delicately spiced and with a more tempura-like batter), gerookte paling (smoked European eel), and rollmops. Kapsalon, is a Dutch fast food dish created in 2003. Raw oysters, which are "platte zeeuwse oester". Broodje bal [nl], a slice of bread with a meatball and gravy, halved meatball served on slices of Dutch whole wheat bread. A saucijzenbroodje [nl] is a popular snack in the Netherlands and is the Dutch variant of a sausage roll. ^ a b c d Kiple, Kenneth F. (2 August 2017). "The Cambridge world history of food. 2". Cambridge University Press. Retrieved 2 August 2017 – via Google Books. ^ "Dutch Food & Eating Out - Holland.com". holland.com. ^ "Kantoor of bedrijfsruimte huren in Rotterdam of Zwolle". wereldexpat.nl. Archived from the original on 23 December 2008. Retrieved 21 May 2015. ^ "Gastronomie: De Nederlandse keuken". Antiqbook.nl. Archived from the original on 28 September 2007. Retrieved 2 August 2017. ^ Ukers, William H (1922). "The Introduction of Coffee into Holland". All About Coffee. New York: Tea and Coffee Trade Journal. ISBN 0-8103-4092-5. Retrieved February 12, 2010. ^ Dobelis, Inge N, ed. (1986). Magic and medicine of plants. Pleasantville, NY: Reader's Digest. pp. 370–371. ISBN 0-89577-221-3. ^ "Nederlands BakkerijMuseum". Bakkerijmuseum.nl. Retrieved 2 August 2017. ^ a b c d Wintle, Michael (2006). "Diet and Modernization in the Netherlands During the Nineteenth and Early Twentieth Centuries". In Thomas M. Wilson (ed.). Food, Drink and Identity in Europe. Rodopi. pp. 63–84. ISBN 9789042020863. Retrieved 28 December 2012. ^ "Kantoor of bedrijfsruimte huren in Rotterdam of Zwolle". Wereldexpat.nl. Archived from the original on 23 December 2008. Retrieved 2 August 2017. ^ Thea Spierings (2008). Dutch Cuisine: Discover the Secrets of the Dutch Kitchen. Miller Books. ISBN 978-9087240868. ^ "Anijsmelk". Thedutchtable.com. Retrieved 2 August 2017. Wikimedia Commons has media related to Cuisine of the Netherlands.